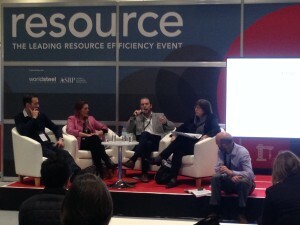 Yesterday Tom was invited to be part of a panel discussion at ecobuild 2016 titled – ‘To what degree can products and materials unlock resource efficiency in buildings?’ The aim of the talk was to discuss resource efficiency associated with products and materials we currently use and explore systems, products and mind sets which can lead to increased resource efficiency in buildings. A diverse panel representing various stakeholders from the construction industry allowed for a wide variety of perspectives. Alongside Tom were; Cat Fletcher Refuse Manager of Brighton and Hove City Council, Jane Thornback Sustainability Policy Adviser for the Construction Products Association and Tom Barnes of Vastern Timber a producer of British Hardwood. Each member of the panel gave some background on themselves, their profession and their views on achieving maximum resource efficiency in the built environment followed by questions from the host and audience. Tom Barnes spoke about how 1 tonne of CO2 is sequestered for every m2 of timber and described the amazing supply of timber in UK forests which is underutilised due to a weak UK timber industry, cheap imported timber and inconsistent short-sighted government legislation. Cat Fletcher described herself as a co-ordinator of waste; sourcing waste at its origin, working collaboratively to find new uses thus saving it from landfill. She made an important distinction about waste; waste is the by-product of producing or dismantling something, it is not necessarily rubbish, its life as a material is not over as most people see it and more often than not it can be reused or up-cycled. She gave the example of how a denim shorts manufacturer based in Leeds supplied her with 2 tonnes of denim off-cuts which she used to insulate a wall in the Brighton ‘Waste House’. Tom emphasised the importance of highlighting the value proposition of a product; offering superior products which outperform the competitor or solve a problem of the customer rather than their renewable and sustainable credentials. Consumers, for the most part, purchase based on price and performance, if there is an environmental or societal benefit it is simply a bonus not a deciding factor. He illustrated how innovative products can outperform the competition using Breathaboard as an example; it passively regulates moisture reducing condensation and damp creating healthier environments, it has superior thermal and acoustic properties and is comparatively cheaper to dispose of than plasterboard. He went on to compare the traditional linear model of production of take, make, waste with circular models where we grow our raw materials, process them in energy efficient systems, use them to their full potential and then compost them delivering the nutrients back into the earth so they can be part of another cycle. Jane Thornback focused on government legislation at both national and European levels stating that serious and determined action and more importantly coordination is required between governments and industry if we and the rest of the world are to continue with high living standards, a point which the rest of panel wholeheartedly agreed with. She referenced the 2015 EU Circular Economy Package as the best piece of legislation to achieve this and is hopeful that it will provide momentum. The cosmic insights to take away from the discussion are that there is not enough time to wait for government to take the leading role, we need innovators, entrepreneurs, coordinators and disruptors to lead by example and to set the trend and to force the rest of the world to follow our lead. We also need far greater collaboration and information exchange amongst these groups if we wish to make a difference in the world and halt the effects of climate change. The main point made is that ‘Circular’ bio-materials such as Breathaboard are being developed and are available on the market and they tend to be higher performing than the conventional materials. There is a need to continue to develop them and find the growing markets and engage with the mainstream in order to make a positive social and environmental difference through delivering superior products in healthy, low carbon buildings of the future. It was a really interesting discussion which spanned various topic areas and sectors within the construction industry, enriched by the variety on the panel. We are looking forward to ecobuild 2017!